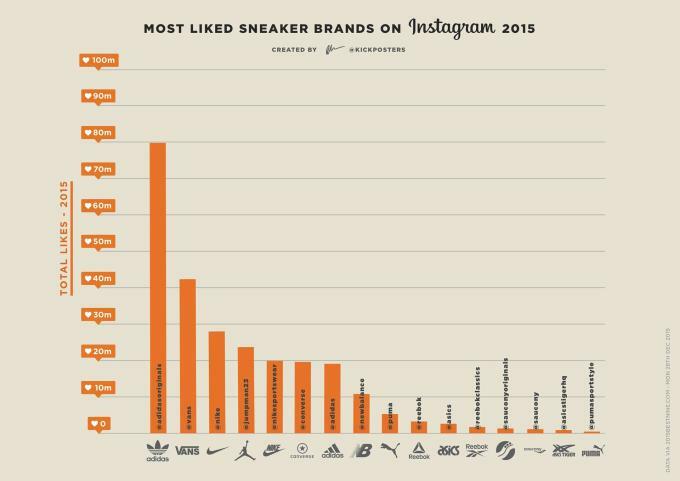 You already know which sneakers raked in the most money for resellers in 2015, but what about where it really counts — the social media likes? 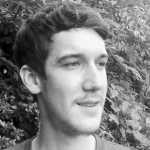 Resell prices are one thing, but in order to understand which brands are really connecting with the youth, one must investigate platforms like Instagram, which is exactly what Dan Freebairn of KickPosters has done with the help of the 2015 Best Nine website. Let&apos;s take a look. In the top spot with 78.8 million likes in 2015 is adidas Originals, which managed to amass nearly twice as many likes as its closest competition, Vans. This is undeniably due in large part to the Three Stripes&apos; high-profile collaboration with Kanye West, which gave the Originals imprint its biggest boost — no pun intended — in years. 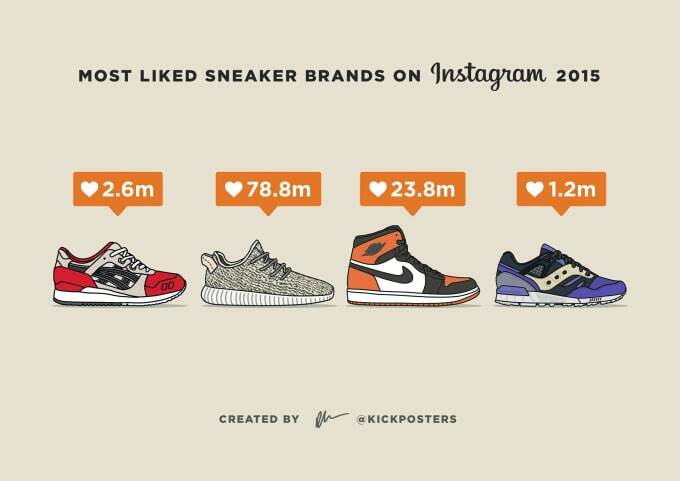 Surprisingly, Nike&apos;s down at number three with nearly 30 million likes, although we&apos;d clearly be telling a different story if the Swoosh was combined with the numbers for Jordan Brand and the Nike Sportswear division. Next, we&apos;ll take a look at a brand loyalty measurement which tracks each companies&apos; likes to followers ratio. Here, Vans takes the top spot, although it&apos;s closely followed by New Balance and adidas Originals. One of the more surprising finds here is that Nike came in last place, which could very well be a sign that the brand needs to reevaluate its social approach moving forward. 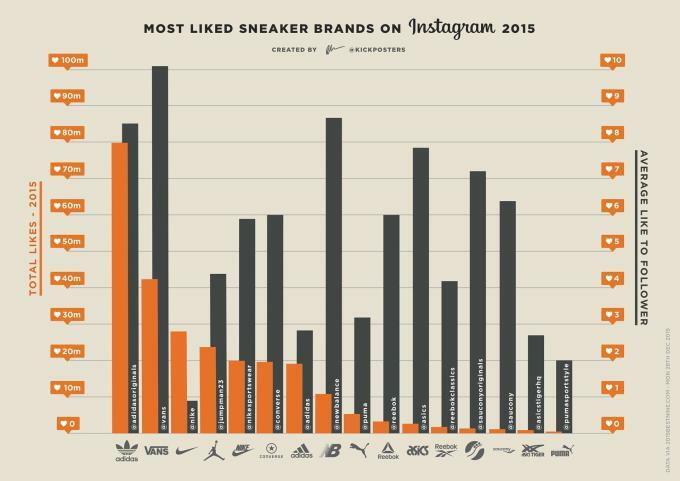 Lastly, KickPosters compared each brand&apos;s total likes to their average like to follower ratio. 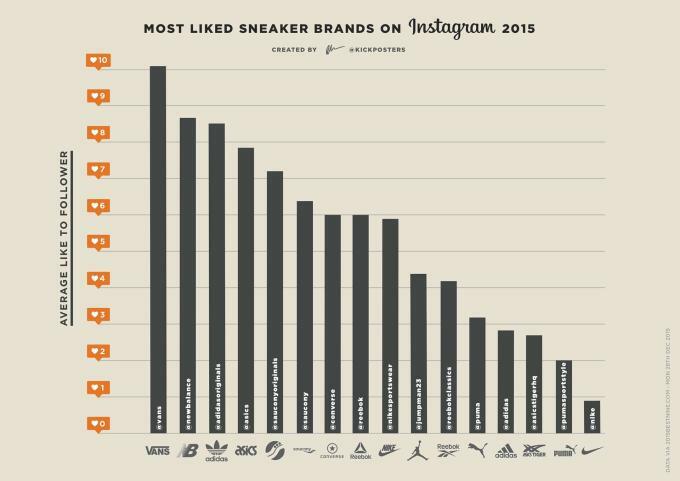 Taking this into account, it&apos;s clear that adidas outperformed just about everyone on Instagram in 2015, although there are more than a few brands positioned to shift the trend as we head into 2016. Stay tuned.